As much as I like thinking that I’m a trendsetter, somehow I don’t think that anyone following behind MyConnie and seeing my brown, super extra large, pure gum rubber, UDT-model Swimaster duck feet fins (circa 1961) bungied on the back would agree. 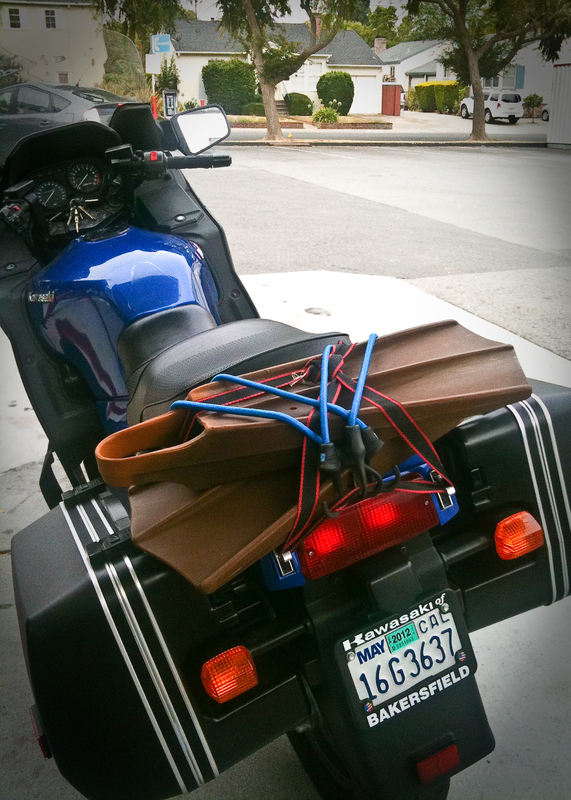 Still, northern California skin divers of a certain age appreciate the spring of pure gum rubber, the lack of kelp-snagging strap buckles, and the thought that a wetsuit, weight belt, hoods, boots, gloves, mask, snorkel, float and towel will fit into the Concours’ saddlebags. First off, Newton’s Fourth Law of Organizational Dynamic states, “The time you planned for getting ready the morning of a motorcycle trip is inversely proportional to the actual time it takes.” That probably isn’t mathematically correct, but you get the point—things never go as planned. So we ended up meeting at the gas station an hour and a half later than planned putting us in a bit of a rush to meet my friend Tom who was running an abalone class for his dive store, Sonoma Coast Bamboo Reef. After topping off our fuel tanks and tires, we headed out of San Mateo on Highway 92, then north on Interstate 280 and on over to Skyline Drive towards San Francisco. As it turned out, that was a big mistake. The typical morning summer fog (no…that’s not a mistake to those of you who have never visited San Francisco in the summertime) was so thick I couldn’t see the Bonnie 50 feet ahead of me. Not only was the visibility almost nil, but the air and road were dripping wet. So much so, that when I approached a red light a bit too fast, I skidded the last 20 feet. Who says coffee is needed in the morning to get your heart going. 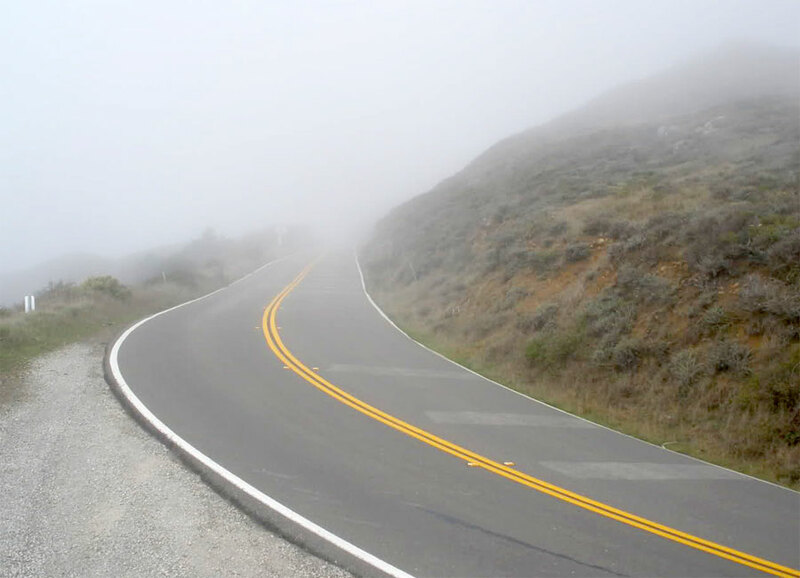 Try some pea soup fog and feeling your rear tire start to slip sideways—that will get your blood pumping! Discretion being the better part of valor, I suggested we divert back to Interstate 280 and head away from the coastal route in favor of sunshine. Unfortunately, that was not to be. The City (meaning San Francisco to any out-of-towners reading this) was completely overcast and misty. So we headed through Golden Gate Park taking the back way to the Golden Gate Bridge. Feeling superior for knowing the beautifully twisty and much quicker “back way” towards the Marin side of the bay, we were taken aback midway through seeing a sign that proclaimed: “Caution, Loose Gravel” immediately upon which we hit loose gravel strewn all over the road. Caution, Loose Gravel?! How about, instead, a sign a mile back that said, “Hey Motorcyclists, Up Ahead There Is Loose Gravel, You Might Want To Think About Another Way Around The Twisties Up Ahead Because There’s A Good Chance You Might Dump Your Bike.” I mean, what good does it do to tell me that I’m in the gravel once I’m in the gravel? I know quite well that I’m in the gravel by the pucker marks being left on my seat, thank you very much. Navigating a 600 pound Connie with an additional 45 pounds of gasoline sitting up nice and high in my overall center of gravity is a “pay attention” experience. Coming right after the pea soup ride on Skyline Drive, I could only wonder if this was an omen of things to come. So after a mile of low speed no-lean cornering, we ducked through the toll plaza tunnel to the vista point merging into traffic going onto the most beautiful bridge in the world. At least it would have been except the crossing of the world’s ninth longest suspension bridge produced thick puffs of dense, wet fog blowing crosswise at about 30 miles per hour. This hounded us up and down the Waldo Grade on the Marin side after the bridge with the heavy overcast only giving way to sunshine 20 miles north once we hit the town of Novato. We then thought we were home free, and it felt so all the way through Santa Rose and even down most of River Road which meanders through the cute little towns that dot the Russian River. But once we hit Jenner-by-the-Sea in preparation for the windy trip north on Highway One, the overcast set back in and cast a gray pall over our adventure. Highway One is one of the most incredible rides. Sweeping vistas, hairpin turns, great asphalt (for the most part)…oh, and…fog, 500 foot cliffs, 2 and 4-wheeled idiots galore, and…cows. Yes, cows. After dutifully avoiding being too angled when transversing the numerous metal cow grates, I rounded a corner and passed by what looked like a teenage Heifer chewing grass in a roadside ditch not a foot and a half from my elbow. I’m a firm believer that the cow knew what he was doing. Otherwise he wouldn’t have lasted a day with all the traffic going by. Still, worrying if a 500 lb. animal who turns its head at the wrong time will ruin my whole day—or life—can make a ride a bit disconcerting. Well, like many things in motorcycling, by the time my mind registered that lil’ bossy was there, he was way behind me. No harm, no foul I guess. What followed was typical Highway One: twisties, twisties…followed by more twisties. I re-learned how to hang-off my bike to keep the pegs from scraping and to keep the rubber-side down. Although I’m far from being a knee-dragger, there is a rhythm and synergy that comes from hanging left, hanging right, then hanging left again in the chicanes that I had forgotten from when I rode daily years ago. Getting into the groove of this rhythm is one thing I really enjoy about riding Highway One. And, about 20 minutes up the coast, north of Russian River, the left-right-left tempo gives way to longer sweeping turns interspersed with straightaways—meaning Salt Point State Park is getting near. Before reaching our destination at Salt Point we passed historic Fort Ross, which was the southernmost settlement of the Russian-America Company between 1812-1841, chartered by the tsarist government to control all Russian exploration, trade and settlement in the North Pacific. It’s a fun tour and chance to stretch your legs while overlooking the gorgeous bluffs and cove. We finally arrived at the Ab Class spot at South Gerstle Cove and parked Bonnie and “MyConnie” (the new nickname I chose for my Concours) on the grass. Arriving late as we did, we met the divers as they were just coming back from the water. So after greeting my best friend and dive store owner, Tom, I unstrapped the duck feet from MyConnie, unpacked my gear from my saddlebags and got suited up. This entry was posted in Kawasaki Concours, Motorcycling, My Connie by pradsliff. Bookmark the permalink. some high page rank contextual backlinks in order to rank your page.